A Japanese soft drink manufacturer plans to send a bottle of sports drink to the moon in an ambitious marketing stunt. The plan is to send up a bottle of Pocari Sweat (a powdered sports drink similar to Gatorade not a bottle of perspiration) on a moon rover launch planned for next year. The aim then is for a child now to grow-up to be an astronaut and one day head back to the moon and drink said bottle of Pocari. Global Post is reporting that the beverage will be delivered by an American firm who plan to plonk a rover – called Space X – on the moon in the latter half of next year. And the idea’s not as daft as it sounds. The US company behind the rover says it has already been approached by a number of brands to send their products skywards too. Reportedly there are a number of private companies in the US with their own space ambitions and one of the few ways they can get funding will be through advertising, product placements and stunts like this. What Pocari Sweat is actually paying has not been disclosed; however, it’s been rumoured it may only be a few million. Which, when you consider the cost of a TVC in the US (particularly during something like the Super Bowl) is not much at all really. 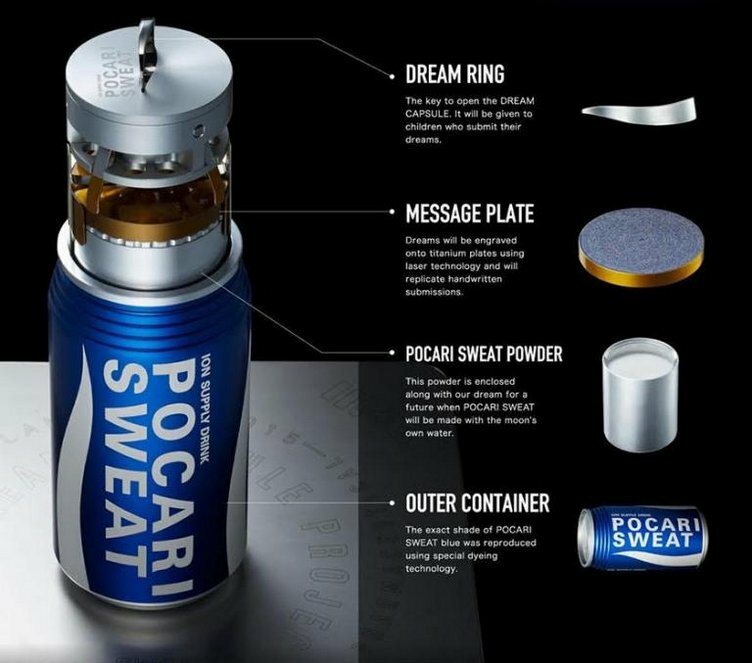 Pocari Sweat has also had to engage a Singaporean firm, Astroscale, to make a special can and vessel for the drink to survive its journey into space and time on the moon before the kiddie grows up and gets to drink the stuff (possibly by 2035). The specially engineered Pocari Sweat can also doubles as a time capsule. It will be packed with titanium plates laser-etched with message from kids and members of the public who submit text via smartphone. Images taken from Pocari Sweat website.